The Free Soil party was a short-lived political party in the United States at the end of the Second Party System. It ran presidential candidates in 1848 and 1852, and some state candidates. After the Compromise of 1850 undercut its position some members returned to the Democratic party, others supported John P. Hale for president in 1852, but he had little impact on the election. Most of the members by 1856 or 1860 joined the new Republican Party. It was a breakaway faction of the Democratic Party and was largely absorbed by the Republican Party in 1854. Its main purpose was opposing the expansion of slavery into the territories, arguing that free men on free soil comprised a morally and economically superior system to slavery. The free soilers were against the expansion of slavery but not the idea of slavery; their goal was to gain the land to the west, and keep the land free of slaves. Slavery was seen as a social bad because it hurt free men, but (unlike the abolitionists) they did not denounce it as sinful. Free Soil candidates ran on the platform that declared: "...we inscribe on our banner, 'Free Soil, Free Speech, Free Labor and Free Man,' and under it we will fight on and fight ever, until a triumphant victory shall reward our exertions." The party also called for a homestead act and a tariff for revenue only (as opposed to a protective high tariff). The Free Soil Party attracted mainly Yankees from the Northeast and upper Midwest, especially Yankee areas of upstate New York, western Massachusetts, and northern Ohio. 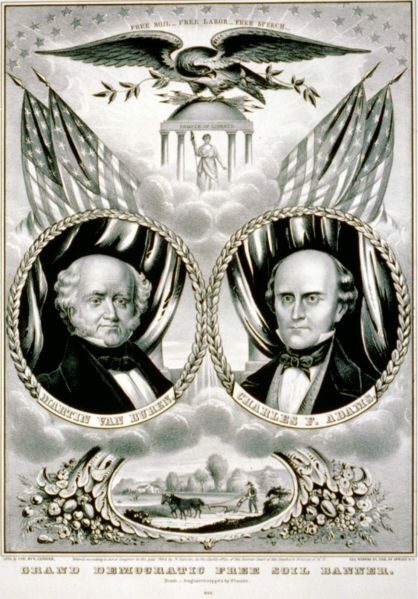 Van Buren / Adams campaign banner. In 1848, the first party convention was held in Buffalo, New York, where the party nominated former Democratic President Martin Van Buren of New York, with Charles Francis Adams of Massachusetts as vice president. The main party leaders were senators Salmon P. Chase of Ohio and John P. Hale of New Hampshire. They won no electoral votes. The Free Soil Party more successful than most third parties. It elected Congressmen, sending two senators and fourteen representatives to the thirty-first Congress, elected in 1848. Its presidential nominee in 1848, Van Buren, received 291,616 votes against Zachary Taylor of the Whigs and Lewis Cass of the Democrats; Van Buren received no electoral votes. The Party's "spoiler" effect in 1848 probably put Taylor into office in a narrowly-contested election. Its long-term impact was to allow antislavery Democrats an easy transition into the Republican party, which formed in 1854 and incorporated Free Soil principles. Important Republicans included Senator Charles Sumner, architect of Reconstruction, Vice President Henry Wilson and Treasury Secretary Salmon P. Chase. This page was last modified on 26 September 2018, at 11:45. This page has been accessed 10,864 times.